When Bhawna Raj decided to take a break from her career in design and advertising and pursue her passion for baking, the National Bakery School at LSBU was the obvious choice. Bhawna said her lecturers gave her a great foundation to build her dream on, and shortly after graduating with a Diploma in Craft studies in 2011 she started baking for friends and family and set-up a home-based baking business. It was going well, her work was published in cake magazines and she was writing cake decorating tutorials within a few months of starting out. Studying at the National Bakery School was a blessing, it changed my life for good. While there were many books and websites offering recipes and tutorials, there was nothing in the market that catered to the actual baking process. There was a desperate need for software so young baking businesses, like Bhawna's, could focus on doing what they love instead of drowning in administrative tasks. In 2011, Bhawna and her husband created their first cake calculator called Cake Tier Stacker, which could calculate cake servings and show dowel placements when making a cake. They shared this tool with the baking community and it was an instant hit. Feedback encouraged them to develop more tools and her husband left his banking software job and she paused her baking business to develop this new venture full time. I was the Baking and he was the IT. Together we created Bakingit.com! With this software users can manage inventory, recipes, contacts, cost their products accurately, design and sketch cakes in 3D, send quotes and manage their orders all from one platform. After four years of development and feedback from thousands of bakers worldwide, they launched in October 2016. It's surreal to see our software help thousands, it was a tough journey but I wouldn’t trade it for anything. Their biggest professional achievement to date is creating the 3D Cake Designer. It is comprehensive and has revolutionised the cake business for their users. In creating their 3D cake designer, they had to stretch technology boundaries so that users would not have to download additional plugins. They had lots of support from the worldwide baking community. They shared Bakingit.com’s tools on social media and they were given press coverage in cake magazines. 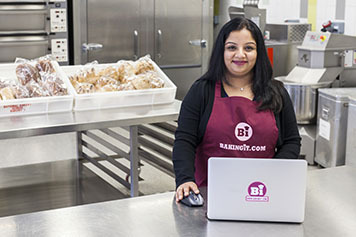 Bhawna and her husband were awarded a generous grant by the UK government in recognition of their innovative 3D Cake Designer and Bakingit.com platform. Ours is a self-funded start-up, so this grant helped us build faster and stay focused on our work. The couple want to grow their business and to create jobs, which has been one of their goals from the very beginning as they believe that is the best way one can give back to the community. They will also be launching a Baking It scholarship programme and conducting courses on getting started with setting up your baking business next year. Bhawna's advice to anyone is to find what you really love and a career will follow. You can contact Bhawna on Facebook, her blog and email.